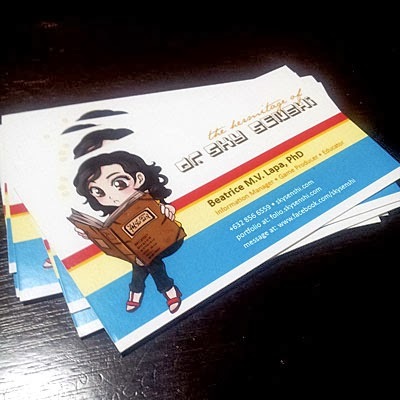 I have been getting my business cards and other printing needs done by Printwiz for a few years now but it’s only recently that I realized that I’ve never blogged about them. Time to rectify this oversight, especially since I always get asked about good offset and digital printers. Here’s one of the owners, Seth, sporting a huge smile (and her rather shy staff). The best thing about this place is that it’s just a few steps away from where I live and they’re also open on Saturdays. 2116 Chino Roces Ave.(Pasong Tamo St.) cor Dela Rosa St.
You can visit Printwiz’s official FB page here and check out the list of services they can offer. Cute Mini-Bea! Haha. Sana yung book cover ay cartoon version ng book mo sa Amazon, para advertisement na rin. CHOS. Super cute ng card mo gusto ko din!!! 300-350 for an entire deck. Di ko maalala kung 100 to 200 pcs. siya though. I will ask. Haha!